This most amazing article appeared in The Phoenix Republic newspaperpossibly in mid 1942 and was reprinted in This is Your America (Literary Classics, New York, 1943). The article was not bylined, and was, most likely, a verbatim news release  or propagandawritten by the PR bureau of the War Relocation Authority to ease concerns of Arizonans who saw the fourth-largest city in their state suddenly grow out of the desert. The article detailed the wonderful, but Spartan conditions, and repeatedly assured Republic readers that Caucasians were in charge, assisted by Japanese who formerly held important positions before the war. RIVERSIndicative of the profound changes brought about in Arizona by the war, an outstanding vegetable farm and a garnishing net factory have sprung up overnight at Rivers, 50 miles from Phoenix. Both are operated by Japanese evacuees from the Pacific coast, the workers in the garnishing net factory being all non-aliens. This is the 15,000-acre Gila River Relocation Center, situated on land leased from the Pima Indian Agency. The center is divided into two communities 3 1/2 miles part, the Canal Community of 5,000 residents six miles southwest of Sacaton, and the Butte Community of 10,000 persons, nine miles directly west of Sacaton. What is this city like structurally? How is it governed, and policed? What are its education and recreation facilities? What kind of stores does it have? What crops are grown? How many Caucasian workers are there? Arizonas fourth largest city is composed almost entirely, so far as living quarters are concerned, of barrack-like buildings. They are made up of fabricated material with a double roof and each is approximately 20 feet wide by 100 feet long. Each barrack is divided into four rooms or apartments, each of which houses on average five or six persons, depending on the family relationships. Two 700-foot wells supply domestic water, with the irrigation water for agricultural land supplied from the San Carlos Reservoir. The communities are made up of blocks, each composed of 14 barracks or living quarters for the residents, one mess hall, recreational hall for club and church activities and for use as a general meeting place. The typical block setup cares for 250 to 300 residents. One of the evacuee residents serves as block manager to look after routine problems having to do with housing, sanitation and so on, and is responsible to the project director. Each block has a representative on the temporary community council which acts as an advisory group to the project director, with certain responsibilities designated to them for the general welfare of the community. The education division now has an enrollment of more than 3,500 students in the kindergarten, elementary, high school and night schools, and is providing an adequate educational program in spite of serious lack of educational equipment and facilities. Although there were no desks, chairs, textbooks or blackboardsnothing but bare roomsteachers and students have made a remarkable adjustment and are holding regular classes, making their own equipment. Painted walls are being used for blackboards, textbooks are being developed by the classes themselves, and table and chairs are being made by the vocational classes of the school. The majority of teachers are evacuee residents, most of them with college degrees and a number with teaching experience. A large number of classes for adults are being conducted both during the day and in the evening under the direction of a special adult education department. Hospital and medical services are available to the residents, with one Caucasian doctor as director and eight Caucasian nurses, assisted by 10 resident evacuee doctors, six evacuee nurses and additional nurses aids. The police and fire departments are manned by evacuee residents with a Caucasian advisor and assistant at the head of each. The police department, or, as the relocation authorities call it, the department of internal security, with a force of wardens, looks after matters pertaining to the peace and security within the center itself. Community government operates through a council of block representatives, somewhat typical of city council government in numerous American communities, together with the added responsibility of recommending law and order regulations and other rules of conduct for these newly developed communities. A commission made up of several attorneys, doctors and others who held positions of responsibility before going to the center, has been appointed to draw up a constitution for the permanent councils for approval by their project director. This will provide the framework for the community government of the project. With minimum facilities available for recreation, the residents have shown their industry and capacity for adjustment to the situation at hand by constructing out of scrap lumber and personal contributions a stage where all sorts of entertainments, including talent shows, drama groups, and movies, paid for by the residents themselves, are held. Basketball goal posts and football goal posts also have been put together out of scrap lumber. Some of the playing fields have been leveled by hand labor, so that at present there are basketball, football, baseball and other playground games of similar character available. There is so much to do, so there is little evidence of idleness. Those not engaged in the many routine services necessary to the maintenance of the two communities and those not on the regular work crews at major projects usually are busy adding to the comfort and well-being of their families, making furniture from scrap lumber, planning grass or small vegetable gardens between the barracks or otherwise making their homes more livable. Leisure time activities are handled by a fairly large group of evacuee workers who see that there is something worth while doing for all groups at all times. Church services are held by both Buddhist and Christian churches. There are several community enterprises, such as the community-owned store where notions, dry goods and a minimum amount of clothing may be bought by the residents. Other community enterprises are in various stages of development, such as barber shops, beauty shops, shoe repair shops and so on. These enterprises will be operated by the community residents themselves through a co-operative association responsible to a board of directors elected by the evacuees, and under a Caucasian superintendent of community enterprises. Agricultural production, which employs some 500 men and women on the project, is probably the most important of the various work projects. Aided by naturally fertile soil, in warm climatic conditions, evacuee labor already has converted 500 acres of alfalfa land into one of the states outstanding vegetable farms, growing beets, carrots, celery and other vegetables. Any surplus production above the needs of the residents here will be made available to other Japanese relocation projects or where most needed, on the basis of priorities established by the War Relocation Authority and the military. The project director has a staff of 150 Caucasian employees to assist him in carrying out his responsibilities for maintaining peace and for the general welfare of the community. 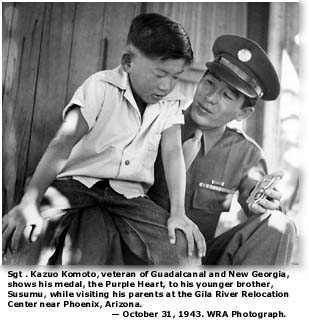 The project has its own Japanese American Citizens League, in addition to Boy Scout, American Legion and other groups. Evacuees may request passes for visitor friends, who might wish to go in to see them, through routine channels.